Update!! After watching Dr. Michael Gregor on NutritionFacts.org, it may be wise to consume spirulina sparingly if at all. It may hurt your liver and it’s linked to ALS, Alzheimer’s and other neurological diseases. I’m leaving the recipe up, but feel a responsibility to share this news, as I’ve just learned it. Here are a couple links from his website explaining the possible risks. Spirulina is a brilliant green powerhouse food! This natural algae is loaded with protein, essential amino acids, iron, calcium, vitamins A, C, D. B-1(thiamine), B-2 (riboflavin), B-3(nicotinamide), B-6 (pyridoxine), B-9 (folic acid) and B-12. It may also help with allergies, detoxing from heavy metals and weightloss. People have been eating it for thousands of years for its nutrients and health benefits, so I decided to try it too. I have the granules and when I tried to eat them straight out of the bag, they stuck to my teeth and turned my mouth and tongue a lovely shade of deep, dark green. I could imagine adding spirulina to soups and mixing into a sprinkle. 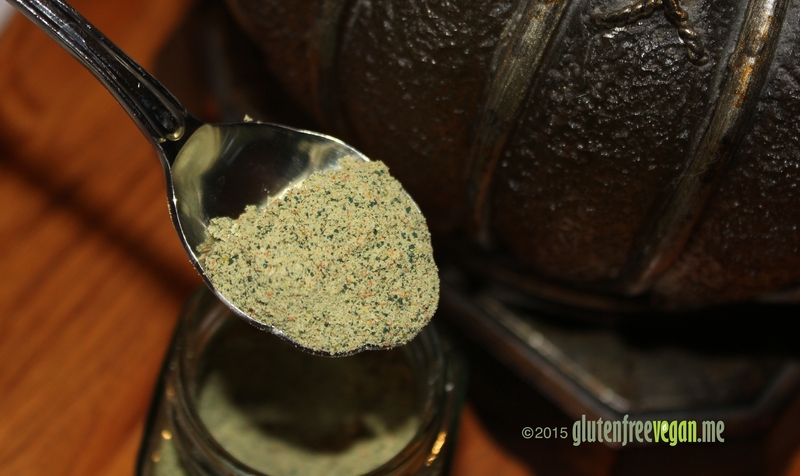 You can also buy spirulina powder, which might be easier to mix with food. Here’s what I made with my granules and I love it! Place all ingredients in a high speed blender (I used the small Blentec container for nut butters) or a clean coffee grinder. Blend to a powder. 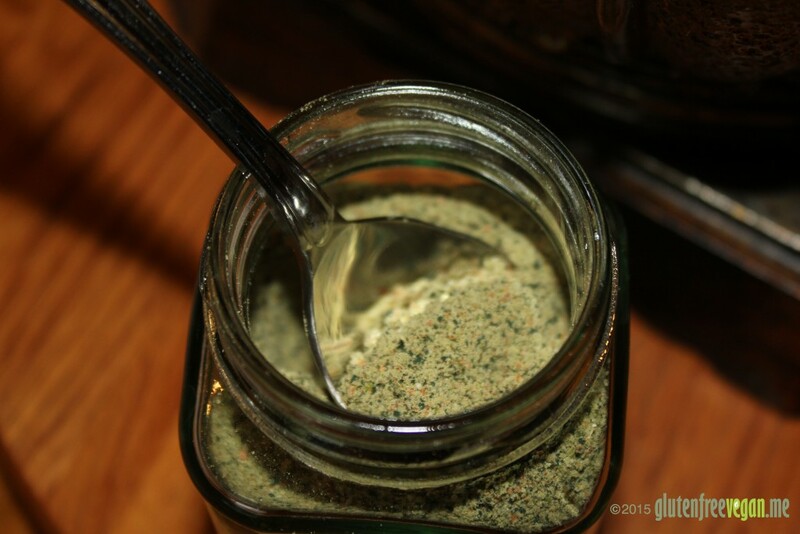 Sprinkle on popcorn, veggies, toast and anything savory. 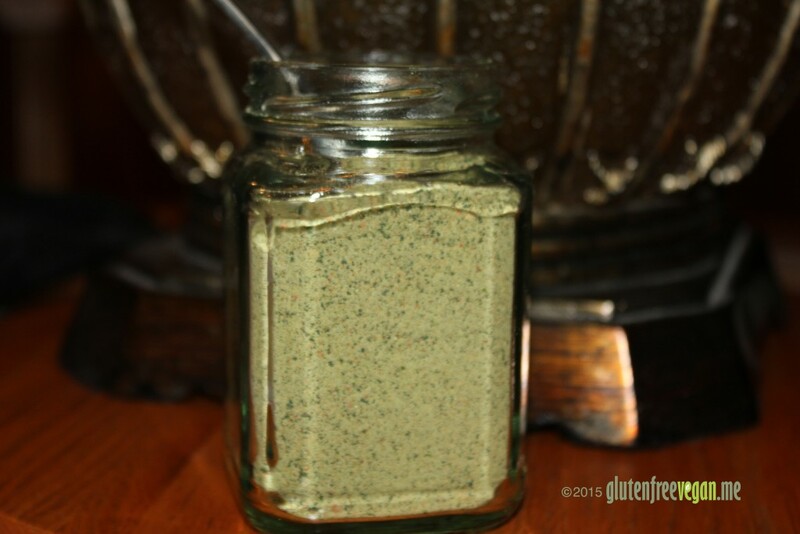 This entry was posted in Recipes, sauces, Vegan Information and tagged gluten-free, glutenfreevegan.me, glutenfreeveganme.com, healthy, popcorn flavoring, recipe, spirulina, vegan, vegan cooking, vegan recipes, veggie spice, veggie sprinkle. Bookmark the permalink.